My husband and I have been in transition for a few years because of a move and a new business. We ended up in an apartment conveniently close to our office which was great. But some of the things I missed the most were the deck on the back of my house, the whiff of hamburgers cooking on the grill, and of course, sitting and enjoying a glass of wine or a cocktail on that said deck. A little balcony just didn’t quite cut it for me, I desperately need outdoor living space. Fast forward a few years, and finally (just within the last three months), we again purchased a home and are settling in. You can probably guess where my favorite spot is. Yep, our back deck. 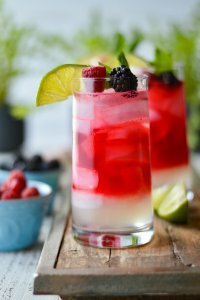 And I’m so thankful that the weather is starting to be warm enough so I can hang out with a refreshing cocktail like the one I’m posting here. The light, crisp flavor is a taste of summertime. When the weather starts warming up, there’s nothing like sipping a relaxing aperitif on a Sunday afternoon as you feel the warmth of the sun on your face. Weekends deserve a drink like this. 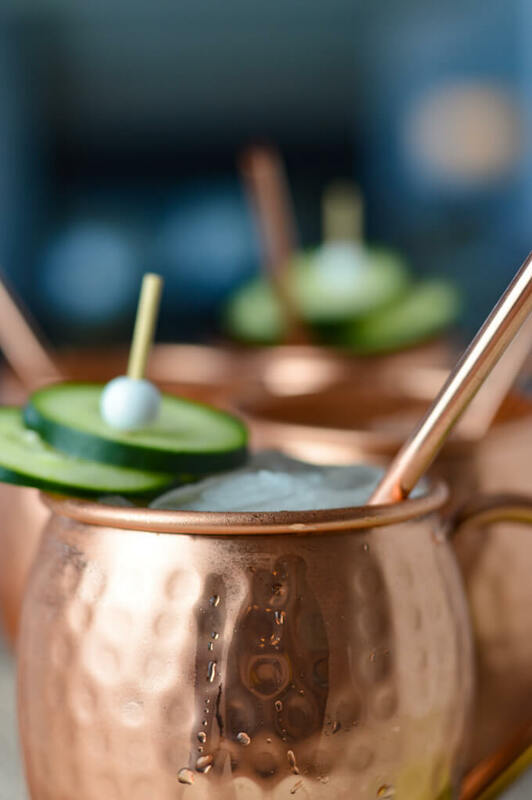 Muddled cucumbers add a freshness to the overall drink experience. You wouldn’t think cucumbers and ginger beer would go together. But honestly, it is a wonderful blending of flavors. Ginger Beer adds a nice fizz to the drink. The carbonation gives it an invigorating zing. This individual recipe can easily be converted into a pitcher for a party. You don’t want to play bartender all night if you’re having a get-together with friends. It’s super simple to mix up a pitcher so that everyone can serve themselves. 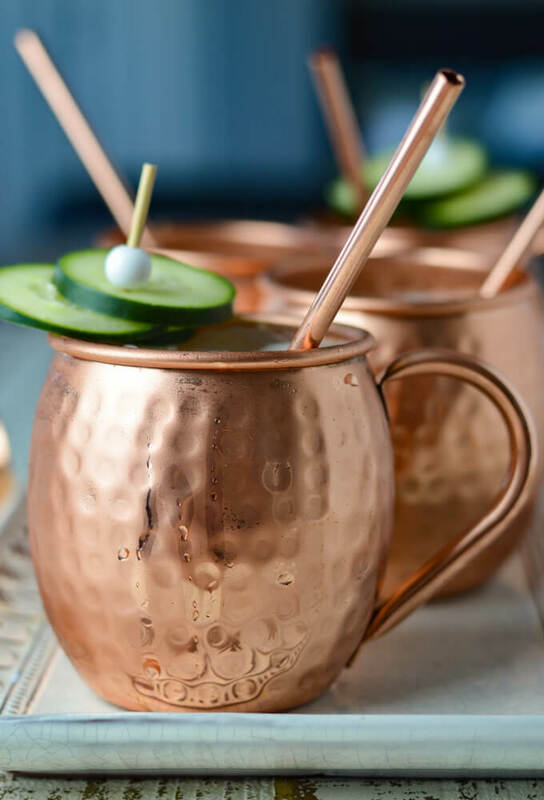 There’s nothing quite like the combination of ginger beer, fresh lime juice, and vodka that is found in the Classic Moscow Mule. But when you add some muddled cucumbers to this already refreshing drink, it then creates a crisp and clean taste for you to fully enjoy. Freshly Squeezed Lime Juice – if you have it, by all means, go for the freshness of real lime. Listen, there’s no comparison to it and lime juice from a bottle. Grabbing this green little citrus and squeezing will truly make all the difference in the end product. Good Vodka – you don’t have to go for the top shelf brand, but don’t end up on the bottom either. Tito’s or Svedka makes a really nice vodka that goes well in this Moscow Mule. Another great alternative if you’re truly an all-out cucumber fan, go with an infused cucumber vodka. Ketel One makes amazing botanical vodkas in a variety of flavors. 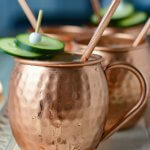 With this Cucumber Moscow Mule, I tried one with regular vodka and one with the cucumber vodka. Either one is awesome, but I probably prefer the cucumber infused one. Gosh, can’t you tell I hate my job! 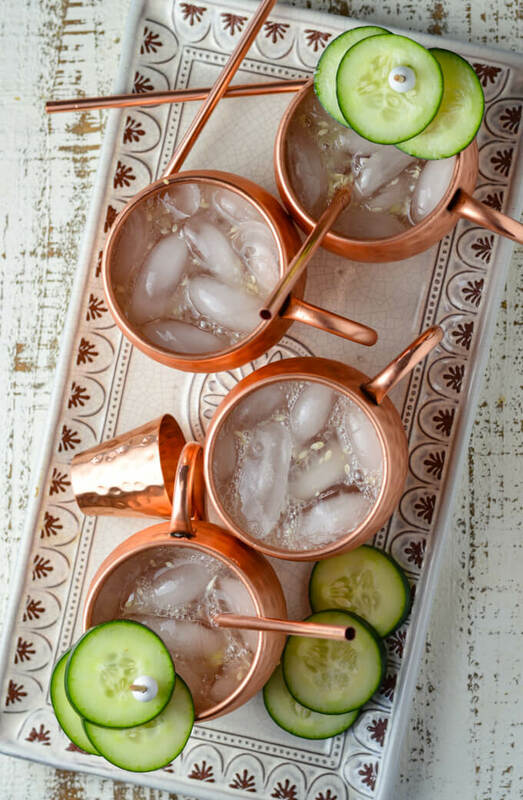 Start with muddled cucumber, lime juice, vodka and a handful of ice chunks in a stainless steel cocktail shaker. Cap it and “shake, shake, shake,” shake, shake shake,” shake your … well, you know what. It takes about 15 seconds and you’ll feel the chill on the outside of the shaker. Uncap and strain it into a copper mug. Top it with about 5 ounces of chilled ginger beer. Add additional ice and there you have it … the best Sipping Summertime Cocktail around. 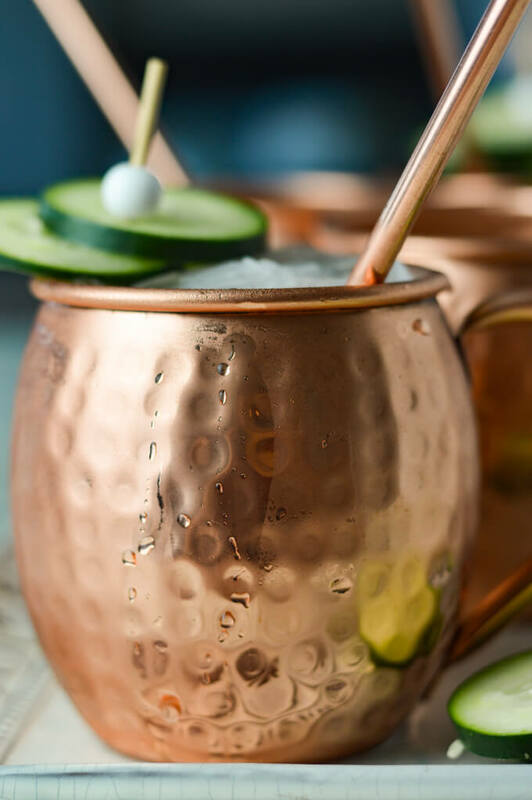 A Copper Mug is an authentic way to sip this Cucumber Moscow Mule. Okay? … why? It’s all about the beauty. The mug itself is a gorgeous work of art and honestly, you will look so awesome drinking out of such a sophisticated chalice. I’m all about the presentation of how something is served. For instance, I can’t drink wine out of a red dixie cup. I know it’s silly, but I just can’t do it. It’s all about the science. There’s a reaction that happens when the carbonation of the ginger beer comes into contact with the copper. Fizzy bubbles spew in the air and enhance the aroma while taking a sip of your Mule. It’s all about the temperature. The chilled drink in the copper mug produces an extra cool sensation on a hot summer day. 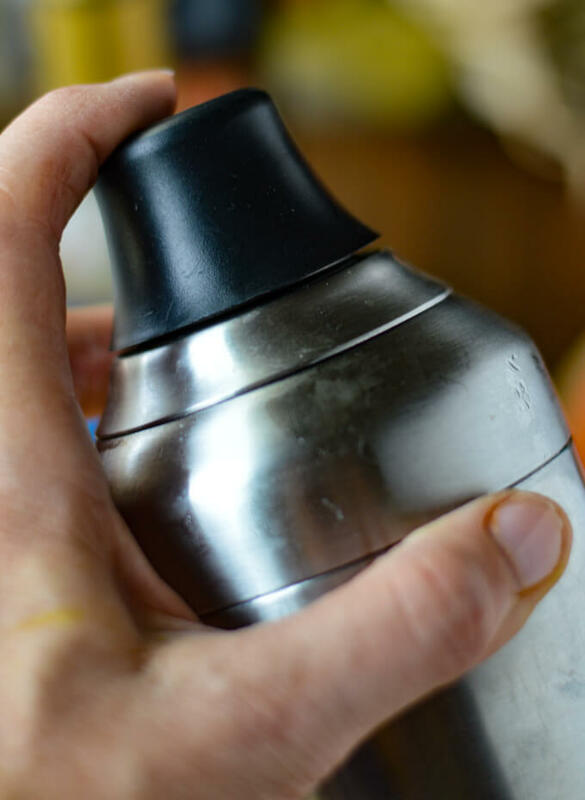 The metal quickly takes on the cold temperature of the drink and is highly effective for deflecting the outside heat while insulating the icy cocktail. Bottom line, it keeps your drink colder for longer as is visible on the frosted mug in the photo above. One other thing I would recommend for this frosty chilled cocktail is to keep your vodka in the freezer and your ginger beer in the refrigerator. Therefore when the ice comes in contact with these ingredients, their taste won’t be diluted because of room temperature ingredients. A Moscow Mule is all about how cold it is and, believe me, the colder the better on a hot sunny day. Sometimes I just want to shake things up a bit, go off the grid and try something new. I will always come back to the classic Moscow Mule, but every once in a while, I like a change. Consider these variations. 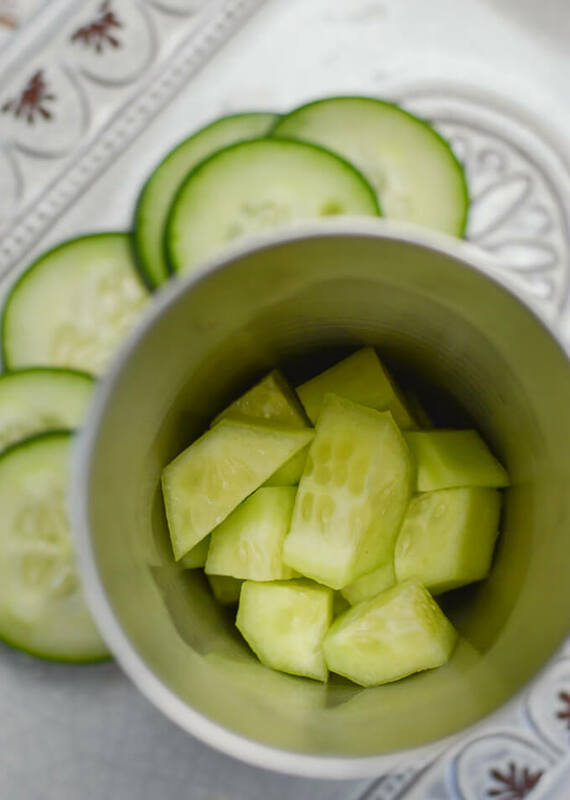 Follow the recipe below while leaving out the cucumber and following the variations. Jalapeño Mule – muddle slices of jalapeños with a couple of lime wedges and five mint leaves. Add tequila instead of vodka. 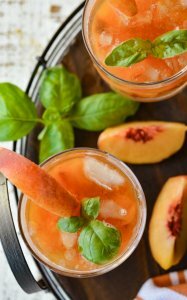 Fresh Peach Ginger Mule – Muddle three large slices of ripe peaches with thin slices of fresh ginger. Add Gin instead of vodka. Blueberry Mule – muddle a handful of ripe blueberries with a couple of lime wedges and five mint leaves. Stay with vodka. Strawberry Mule – muddle 5 fresh strawberries with five mint leaves and a couple of lime wedges. Stay with Vodka. 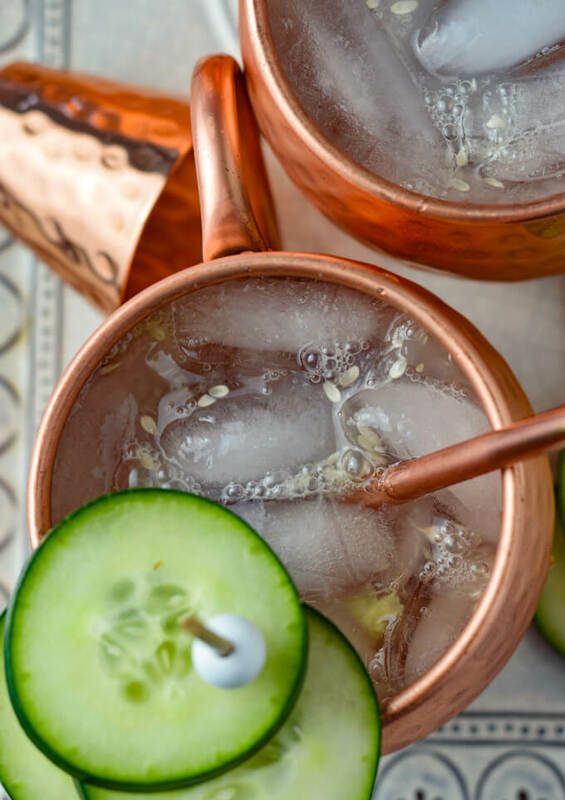 Skinny Cucumber Mule – use the same recipe as below but add sugar-free (diet) ginger beer. This single serve recipe converts easily into a gallon pitcher for a crowd. It’s a great way to alleviate the need for someone to man the bar all night and gives them opportunity to mingle and enjoy the party instead. 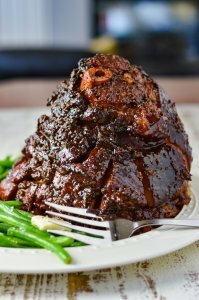 This also can be made a couple of hours ahead of time and stored in the refrigerator until ready to serve by adding the ginger beer and the ice at the end. Muddle the cucumbers in the bottom of the pitcher. Add the fresh lime juice and vodka. Store in the refrigerator until ready to serve. Add ginger beer to the pitcher last minute and ice to the cups. You can strain the cucumbers if you so desire. I probably wouldn’t go to that much trouble. Just pour and enjoy. Cocktails are seriously one of the easiest things to whip up. It takes just a few ingredients and very little time. For instance, this Cucumber Moscow Mule was ready to drink in less than five minutes. What lovely photos. I’m so glad you’re back in a house. When I was young like you, I could have lived in a teepee, but any more, I need four walls, a roof, and definitely a backyard for when the weather is nice! Awwww Thanks Mimi! I completely agree with your about needing four walls, a roof and a backyard. It’s nice to have a place to really call home again. This post is definitely giving me spring fever! I love the different variations. I think I’ll try them all! Hahaha Niki! So … let’s get together and try them all. That could be a fun afternoon.